In 2014, The National Trust conducted an extensive survey involving 7,000 children and 1,000 parents and grandparents. According to the researchers involved, the purpose was to try to gain insight into how much time children spend outside and compare it to previous generations. The results were nothing short of alarming. According to the results generated, most children are outside for less than an hour each day. This was a dramatic drop from the previous generation (the parents) who played outside for an average of two hours and 34 minutes. For grandparents, the average amount of time spent outside was over three hours a day. In total, that’s a drop of over two hours per day, in the space of only two generations. These are worrying statistics indeed and say much about the current levels of physical activity that our children are currently engaged in. Less Enthusiasm for the Great Outdoors? Whilst both the parents and grandparents involved in the National Trust’s survey were enthusiastic about their childhood experiences outdoors, the current generation of youngsters seem to be rather less enamoured by the prospect of spending time outside. Indeed, the research discovered that many traditional outdoor games, valued for hundreds of years, are close to dying out. For example, 90% of the children asked had never played conkers, or used a map or compass. Dependence on Gadgets to Blame? It’s a common theory that modern technology is to blame for the reluctance of the younger to venture outside. Games consoles, laptops, smartphones and tablets often prove to be highly enticing for children, encouraging more time spent on the sofa and less time out in their gardens. However, whilst this may be the reason in the home environment, the big question is, why is the same true in schools? After all, time spent on electronic devices is limited in most classrooms and use of smartphones is generally banned. What is it exactly that is holding kids back when it comes to being out in the playground? Experts suggest that it could be the lack of protection from the elements that is stopping school children from enjoying the full benefits of the playground. Unlike other countries, the UK has a notoriously unpredictable climate; and rainfall is especially common in the colder months. When it rains, most schools tend to allow students back into the classroom, rather than insisting they remain outside in the fresh air. This is especially the case for establishments without school canopies; as there literally is no other option and no place in which children can shelter from the bad weather. However, this lack of school canopies is costing children dearly; denying them the opportunity to be out in the open and to take a valuable, vital break from the classroom. Vitamin D. Vitamin D, or the ‘sunshine vitamin’ as it’s sometimes known, comes from the sun’s rays and performs a vital function within the body. It helps to maintain healthy bones and teeth and is even thought to help protect against severe diseases, such as MS and diabetes. Decreased depression. Certain studies have found a link between depression and lack of exposure to sunlight and fresh air. Certainly, whatever the exact nature of the link, it does seem evident that children are happier when they have enjoyed some time outside. Energetic play. Playing outside gives children the perfect opportunity to clear their heads, burn off some excess energy and exercise their muscles; all of which are vitally important when it comes to physical and mental wellbeing. Improved eyesight? According to a study at Cambridge University, there are even links between spending time outside and enjoying better eyesight! 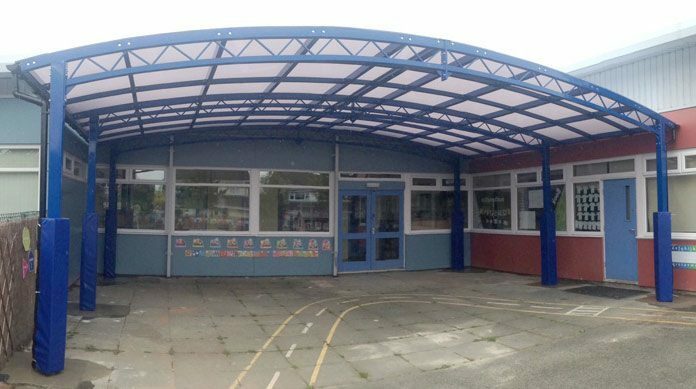 School canopies provide an excellent, cost-effective way of ensuring children get the fresh air that they need whilst at school. They open up a range of possibilities for students to enjoy the outside environment; not just during break and lunchtime, but also during class-time too; as the areas protected by the canopies can be used for classroom activities.